From a comment Janice made, I wonder if the Vitrified and Supervitrified wares use different shape numbers. I've looked out some technical info and it is fired to the same temperature, but the materials used are different. So we shall see what turns up when looking at this subject. 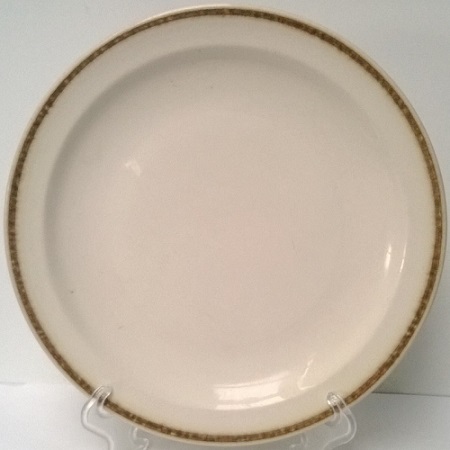 This plate is Supervitrified Gibpat, it is a Rim Shape almost 10 inches and it has a pattern number d643. My question is could this be a shape 4623? If one size is right you have the whole range. 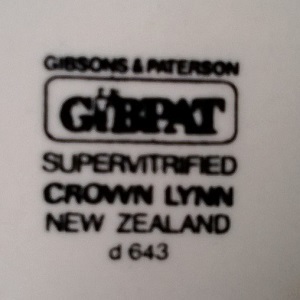 I just checked my Gibsons and Paterson bakeware which is 1968 and has the green G&P vitrified stamp. I note that this is a supervit stamp, but was this stamp used in 1969? That may not matter of course because 1969 is just the date for commencement of the shape. As per the other topic, I can't check my own until I get back to Whangarei. And we only have dialup here so it's sooooo slow. Thanks I will run with this as it is the right size unlike the rest of my vitrified wares! I rarely buy plates that I don't plan to use, especially stained ones, but as you've been trying to sort them out I got this one. I have had a quick look but haven't spotted it in the gallery yet. 180mm OD, 20 H, 30 Rim. 180 could be 7 inch. Could it be a 730/7 Hotel Flatware vit? BTW: this is really thick and heavy. Your plate has a very wide brim which has thrown a spanner in my thoughts about plates. Too bad that there isn't a date on it. 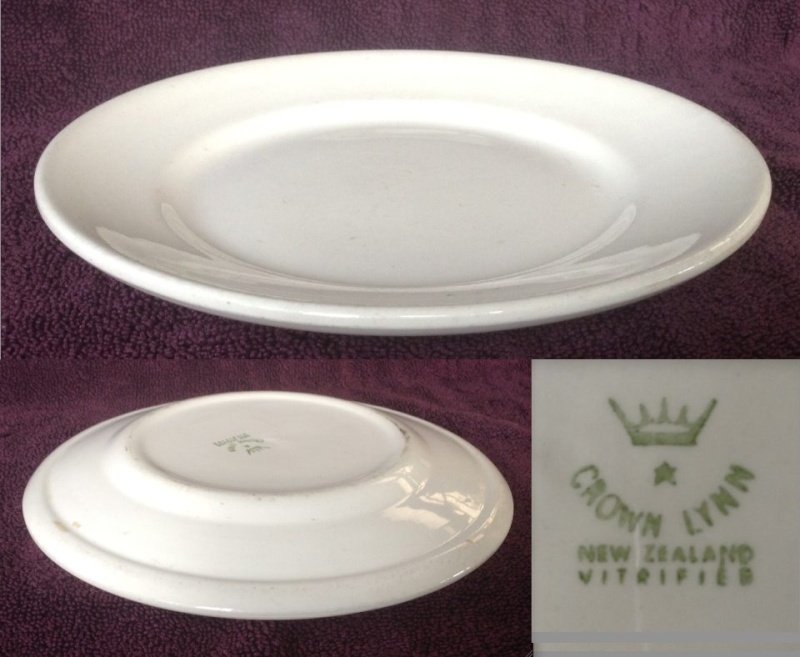 I'm going to look out some pics of Crown Lynn plate shapes and post them to help us out here. This is from the new vitrified range 1968, but doesn't have any numbers, they will be in the vitrified records however. Now I want to reassess what we have in the three digit gallery for the 766 and 765 shapes !! Yeah, pity about the date, but the mark with the star must be some indication of date, ie before dating started. So, find the earliest date number on this type of backstamp and work back. I noted the wide brim, which is why I made a point of giving a measurement for it. I don't recall seeing a plate like this before. Could be they reduced rim size on re-numbering. And 7 inch certainly is an odd size: the 730 is the only one I could see. but there is no seven inch! Val Monk has that backstamp as 1960's estimate - page 156. So your plate could certainly be three digits.